Born Margaret Teresa Yvonne Reed on 27 August 1916, Butte, Montana, USA, Martha Raye was an American icon in her own right. Known as "The Big Mouth" she was soon considered the female equivalent to Bob Hope. Martha made her acting debut before the age of 10 as she toured the nation with her parents variety show "Reed and Hopper" with brother Bud. Martha and Bud so consistently stole the show that the name of the act was eventually changed to "Bud and Margie." Although successful so early her life wasn't easy. She had so little formal schooling, her scripts had to be read to her. Following the demise of her TV variety show, the breakup of her fifth marriage, and a series of other personal problems, she attempted suicide with sleeping pills on August 14, 1956. After her recovery she always wore a St. Christopher's medal, a St. Genesius medal and a Star of David given to her by well wishers. At the end of her TV programs she also would say "Good night, Sisters," a reference to The Sisters of St. Francis Hospital in Miami where she recovered. Martha was an honorary Green Beret and visited U.S. Army Special Forces in Vietnam without fanfare. A registered nurse Lt. Colonel helped out when things got bad in Special Forces A-Camps. She soon became affectionately known by Green Berets as "Colonel Maggie." The Jean Hersholt Humanitarian Award was given to Martha in 1969 for her work with charities and entertaining U.S. troops; her estate gave it to the Friars Club in 1997 where she was its first female honorary member. She received the Women's International Center (WIC) Living Legacy Award in 1988. Martha was also awarded the Presidential Medal of Freedom in November 1993 by President Bill Clinton. Ever hopeful of finding her "soulmate" she married 7 times. She married her last husband Mark Harris after knowing him for less than a month. He was 42; she was 75. She later suffered from Alzheimers, cataracts and liver disease, and had lost both legs the year before her death due to circulatory problems. Martha died of pneumonia at Cedars Sinai Medical Center in 1994. Martha left the bulk of her estate to Mark Harris, but left some money to People for the Ethical Treatment of Animals (PETA). 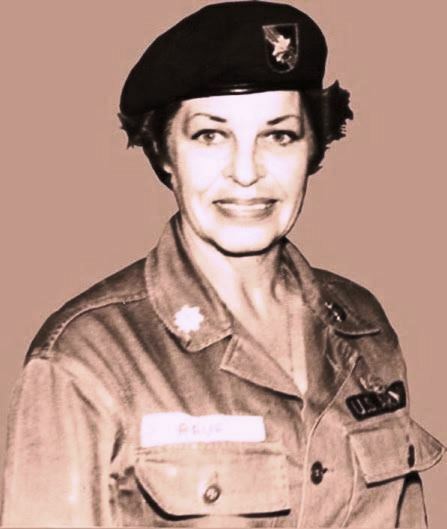 Martha Raye, the only woman buried in the Special Forces cemetery at Fort Bragg, NC. She joined the USO oon after the US entered WWII. During WWII, the Korean War, and the Vietnam War, she traveled extensively to entertain our troops, despite her extreme fear of flying. In 1966 she went to Vietnam to entertain two platoons of airmen, both were called out on a mission. She held the show there till they returned. She often served as a nurse on these trips. To quote Martha in a way that sums up her life, "Only cowards give up the search for happiness because they're afraid of getting hurt." She never gave up and she definitely brought much happiness to the lives of those she met and entertained.